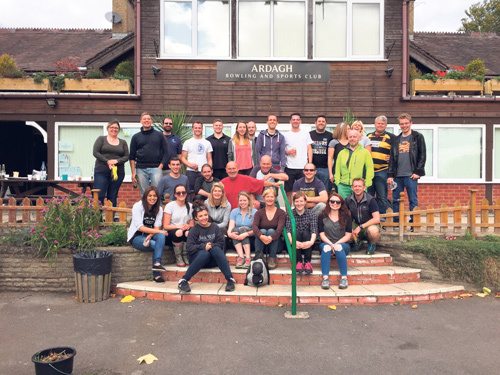 Staff from the Bristol office of commercial property specialist, Colliers International, have spent a day away from the office making a difference at Horfield Common. The work, which was carried out in conjunction with the Friends of Horfield Common (FoHC) community group, included installing fencing to create a new wildlife garden as part of the Friends' five-year wildlife and biodiversity plan, which has been developed with Avon Wildlife Trust as part of the 'My Wild City' project. Volunteers from Colliers International helped to maintain the new hedgerow planted by FoHC volunteers over the winter 2015, and helped to refurbish a shipping container at the Cafe on the Common, a community business set up by the Friends' group to provide an indoor seating area. They also worked with members of the Ardagh Shed Men group - a project for older men in the local area - to make bird and bat boxes to support delivery of the wildlife plan, as well as making planters and furniture for the Ardagh gardens which are being reinstated by volunteers from the Friends' gardening group.